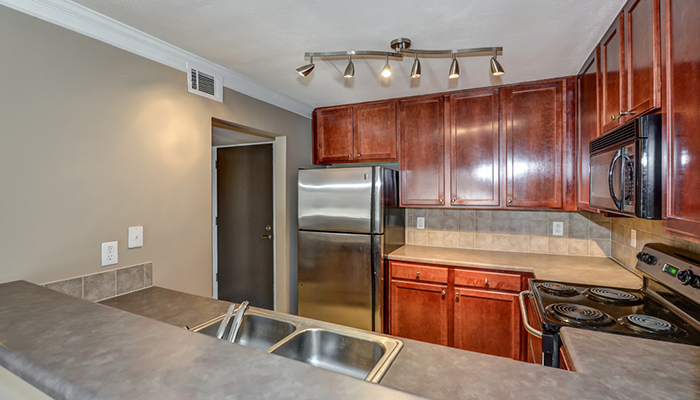 Completely renovated 1BR/1BA condominium in a gated community right across from Blackburn Park. Walk to park, shopping, restaurants and YMCA! This Brookhaven gem features code entry into building, hardwood floors in living/dining room combo and bedroom; tile in foyer, kitchen and bath. Beautiful stained cabinetry, modern track lighting and stainless steel appliances adorn this kitchen featuring a breakfast bar that looks out to the living area. Two floor-to-ceiling windows plus glass double doors allow great natural light in as well as lets you walk out to a private patio and greenspace perfect for Fido. Community features a clubhouse for special events, pool, and there are quaint sitting areas along community lake.